Image from British Library Medieval Manuscripts blog: Detail of an historiated initial ‘D'(ilexi) with a woman (Duchess Dionora?) 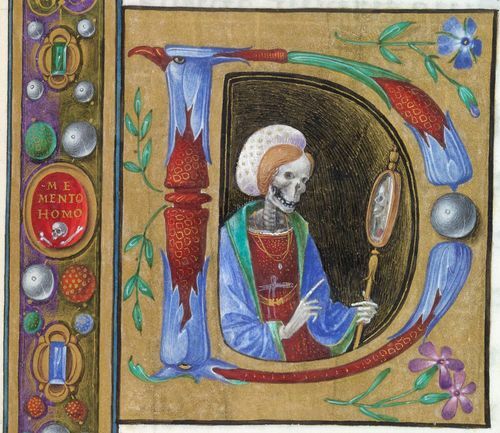 with a skull for a face admiring herself in a hand mirror, with ‘Memento homo’ in a roundel at the left, at the beginning of the Office of the Dead, from a Book of Hours (‘The Hours of Dionara of Urbino’), central Italy (Florence or Mantua), c. 1480. British Library, MS Yates Thompson 7, f. 174r. This entry was posted in favourites, magic + supernatural and tagged Halloween, Old English. Bookmark the permalink.